Having spent now couple of days on the on a quarter mile track with stock engine gen2 the need for quick shifter functionality is evident. In gen1 we implemented quick shifter by utilizing GPS sensor to detect a kind of "Shifter Gear" by connecting a 220 Ohm resistor in parallel to GPS sensor. To avoid putting ecu into error state we needed then to modify the ERROR limits for GPS. In Gen2 the GPS sensor to gear values subroutinge is located at sub_1D100. Inside that subroutine the sensor voltage is converted to gear values or error states according to the following table. So basically it looks like if we change the value #44 in 1d120 cmpui, R8,#44 to a lower number like with gen1 it may be possible to avoid the error state and use alike method to detect when quick shifter is activated. This ecu is so much more complicated and versatile than gen1 so this must be tested, but is a good starting point in implementing the shifter functionality. This means that the address word 0001C77A has a word 0x001F that can be rewritten to a new GPS sensor limit value. Now when we know how to modify the error etc testing of GPS sensor to allow the signal being used for shifter we need to start thinking where to hang the shifter code. Obvious place is after checking the limiters but before calculating fuel. The best potential place looks like at the end of the set rpm gear limiters subroutine. The memory address starting at 0x55400 looks empty and we can put a compiled shifter code starting in that memory address. The jump to the shifter code and back to original ecu code was the way we implemented shifter in gen1. Its quite likely that the same strategy works with gen2 too. so we need to change that code to an adress where we locate shifter code. and add to the end of the shifter code a jump back to original address. Assuming that lr contains the same info as before the jump to the shifter code. Obviously the jmp can not be made to an immediate address, its a branch that needs to be made. Anyhow to test if this same strategy as with gen1 for hanging the code to the main loop we can add this code directly to the ecu using ee2 by patching the code. If the ecu runs perfectly after being reflashed with new code we have a strategy to follow in getting gen2 shifter code working. The visual basic code for above that is used to change the ecu for this loop to shifter address and back to original - and tested to work is following. So we have proved that its possible to hook a subroutine also to a gen2 ecu and execute it. And it has support for m32r. *1: The M32R family differ from other microcomputer families in that their emulator system is connected as an external tool. Unfortunately it looks like we can not run the emulator for M32R like we have done with SH7052 / gen1, so testing the code is not possible. Luckily the code was debugged for gen1 by JaSa and should work as it is for gen2. EDIT : HEW does not seem to support m32r, instead renesas has another tool cc32r for it. The cc32r installs as a trial license for few months. and some spare ram variables for programs internal purposes. M32196F8 has ram area available from H0080 4000 to H0081 3FFF. Ram variables seems to be between 804000 to 8067e3 and 80f800 is used for ram write monitor. So we can guess that e.g. 80d000 could be a good position to reserve some variables for the program use. - GPS sensor is 804318 and is 10bit value. for 8 bit value 804318 >>2 is needed. From ecueditor version 2.0.0.25 onwards the shifter functionality is added. At this stage FUELcut only. The millisecond values for cut time needs to be adjusted to actual milliseonds, now the millisecond values are something else as the main fuel calculations subroutine seems tobe called more often than in gen1. Anyhow this will be fixed as soon as I have time to measure the times or find out how often the main calculations subroutine is called. Anyway the shifter is tested on workbench to work and as gen1 you just need to connect a 220ohm resistor in parallel to gps sensor. ps. Just ordered the cordona GP switch which is both pull and push switch. The shifter will go into the bike as soon as the switch arrives. Alternatively one could use rear brake switch as in the picture below for activation. 09 busa.????? now what....still got what it takes.......! I got what you need...! Is the 220ohm resistor required as well as the Shift Switch? The connection is the same as with gen 1. The kill times are now measured to be millisecond values (rounded to closest 5-10ms anyway). As at this stage this is fuel only killshift the actual times may need to be a bit longer than with gen1 if both fuel and ignition kill is used. The ignition may be implemented later, anyhow as ignition only kill is not recommended because of valve popping risk its not a priority. Edit - added gen2 picture. As a final note at this stage, lets add here why the shifter was implemented at this early of the ecueditor 2.0 building process. Below is a datalog from one of my runs where I failed miserably first fighting the nose down and then with way too long gear shift times. In the past we have measured around 0.2-0.4s ET improvements for quartermile runs just when using shifter. Air shifters are here not allowed on national level racing and therefore very seldom used in amateur classes either. As an attempt to bring the ET:s down started to reverse my K9 shift pattern, but looks like the side stand support bolts have been changed so that it requires also replacing one of the bolts - otherwise there is not enough room for the lever to turn for shifting (so need to get a gen1 type bolt for my side stand support). Personally I really prever reversed pattern as then I do not need to worry where to put the feet after the launch. Also when launching as the feet will be on top of the shifter in case the nose comes up the foot is less likely to throw in the neutral gear. Simultaneously installing a GP switch for the ECUshifter. For pull type you only use the green/yellow and brown wire. (In case one does not use reversed shift pattern then its green/yellow and blue wires that are being used. Anyhow any load sensing swicht including the ones delivered for powercommander will use for this purpose. In addtion to the switch I used GPS connectors from easternbeaver, but alternatively wiring up the shifter directly to the harness could have been possible. The GP switch wire is about twice the length of required wire lenght - so that was also shortened. Installing the GP swicth involves cutting the shift rod and rethreading the rod with 6mm threads into it so that the GP swich can be installed and the rod lenght can be retained. When cutting just make sure that you are not cutting from the wrong end as the other end has a reverse thread. 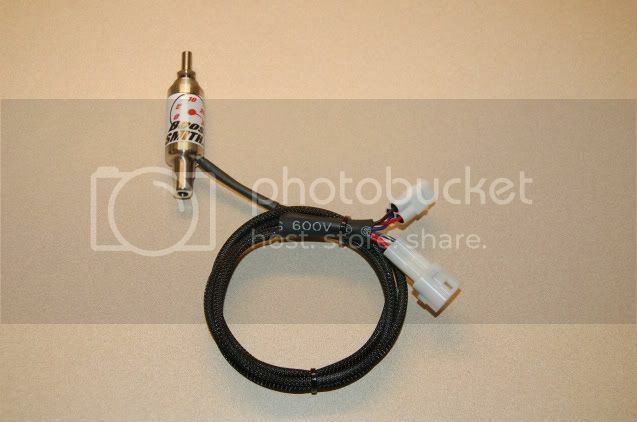 In the picture below is a shifter switch that will plug in directly to the bike harness and replacese the stock shift rod. The 220ohm resistor that activates the shift kill cycle is hidden inside black insulation. The activation "5" is then number of engine rounds that needs to be elapsed before a shift is activated. This "filters" out some noise from switch. The next shift "800" is the number of engine rounds that needs to be elapsed before next shift can be activated. This ensures that an accidentially initiated shift does not happen too soon after an intended shift. The shifter low threshold is set in software and can not be adjusted. Some have reported being able to raise the shift lowest rpm threshold by setting 0 to killtime for higher rpms. Thanks Petrik .................... excellent help as usual. ive made up 3 of them now for customers on gen 2, 1 of them was for reverse shift pattern, other 2 standard. Very nice Greg....anyone try it with an airshifter? Might allow less kill time if it switches at precisly when the pressure is applied? so what kill time are you using at high RPM? I'm keen to hear your progress on the changes. Although the option is there in ECU Editor to kill Ignition, has this feature been built into the software? The reason I ask is tonight while messing with a friends bike we were playing with different kill settings to get his air shifter setup and when doing ignition kill only it doesn't appear to be killing at all. When we turn on fuel cut it does work. Another question is regarding the shifter settings. When you open the box up to adjust the kill times and hit save it will show the values. If you go back into the shifter box, it then defaults back to 80ms in all boxes. The delay settings are doing the same thing. When adjusting them and saving and going back in, the settings default back to 5 and 500. Is there anyway to implement autoshift into this? If you use an airshifter you can connect the trigger to autoshift. Yeah i'm using an airshifter. What trigger you talking about? are we talking gen1 or gen2 here ? you need something to trigger the air shifter rpm based, the ecu doesn't have that control directly as of yet, my launch / shift light with autoshift output can. Greg, i'll probably pick one of those up from you. Not as much interested in the light, just mainly the autoshift if that makes a difference? Also, is the shift output a neg or pos trigger? On my car I have made the shift rod telescopic so that on up shifts the lever movement compresses a spring first and, once there's enough spring compression to complete the shift effectively, there is a micro-switch that operates the shift cut. It's the spring compression that actually changes the gear. That way it can't bounce back if the dogs get nose to nose on an upshift. Plus, with a 'force-sensing' arrangement, all the mass has still to move after the cut has commenced, making it slower, whereas with mine all the movement is done but for the actual shift drum and forks. There is a quick update on shifter code now. Based on user feedback the RPM based shift kill time is changed to gear based shift kill time. thanks for explaining that petrik, i didn't know the reason why ignition kill alone didn't work well etc. For that reason guys running large wet shots of NOS, or turbos with seperate injectors doing most of the fueling on boost, i still recommend going with an ignition kill box seperate of the ecu, for the fear of shutting 180 hp worth of fuel to the engine off if there is still say another 300 hp worth of fuel coming from a microtec (or similar) fuel controller under boost. Also i think this was posted elsewhere, but I know will be asked, this is for gen 2 busa code only. so is the version 2.1.0.?? stable with the old code, and version 2.2.0.?? alfa version is the one with the up-dated shifter algorithim...?? Fuelcut for entire cycle. Ignition cut is soft cut, smoother restart to get the afr correct before going back to full power. This is what I was reading on the oscilloscope - even it was unintentional to do it this way. This also may explain the comments about ignition cut not working. Thats Great to Hear Stocker!! Great Job Petrik, and Thank You for Never settling for Mediocre!!! just for fun, i set all gears to 40ms and went for a very fast ride, it shifted all gears under full throttle, i would expect us dragracers to see a small et gain....love it..
Petrik any plan to make the ignition hard cut, are make it user selectable hardcut/softcut for the turbo guy to be on the safe side? Guyz need some Help PLEASE......Pulling my Hair out here!! Has anyone had ANY Problems with the Last/Current EE2 Update, as Far as the Engine Kill NOT Working??? The other thing I noticed(Dont know if this is a Problem or Not)is when I go into Shifter Program, set it the way I want it, close Program and then go back into it(sometimes takes doing this Twice).....ALL SETTING ARE RETURNED to Default??? Any Help would Be "GREATLY APPRECIATED"
Please log in to post quick replies.